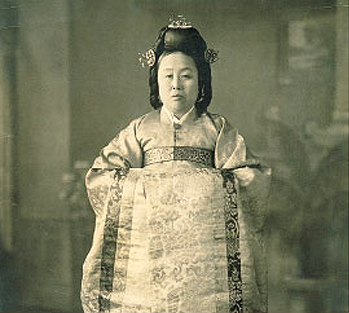 Joseon Dynasty was the peak of royal culture in Korean history, and royal cuisine thus became the quintessence of traditional food culture in Korea. 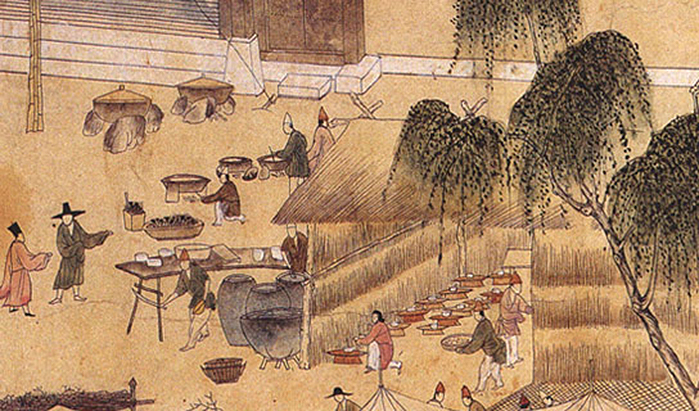 The meals served for the king were prepared by the best cooks in the court with quality ingredients procured from across the country, consisting of local specialties and fresh seasonal foods. Royal cuisine has been passed down by word of mouth of court cooks and royal descendants for generations, as well as in written records of royal feasts. Records on the daily court meals of the Joseon Dynasty can be found in “Wonhaeng Eulmyo Jeongni Uigwe” (Royal Protocols on a King’s Procession) which was written in 1795. The Royal Protocols provide a detailed description about the meals served during an eight-day journey of the king from Changdeokgung Palace to Suwon Hwaseong Fortress where he hosted a feast before he returned to the palace. Usually, meals were served five times a day: restorative medicine of rice gruel or porridge in the early morning; a royal breakfast table around 10:00 am; a simple meal in the afternoon; a royal dinner table around 5:00 pm; and a simple meal at night. 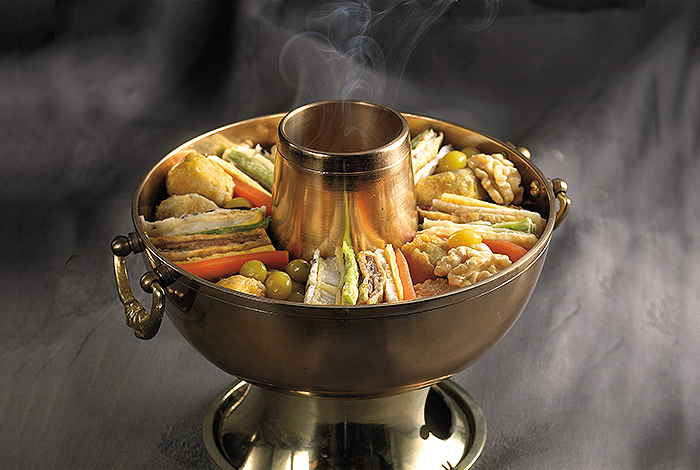 The royal table, called surasang, was served with 12 dishes, including rice and soup, as well as stew, hot pot, kimchi and sauces. Both white rice and sweet rice were served, and the most common soups were miyeok-guk (seaweed soup) and gomtang (beef bone soup). Surasang was further divided into daewonban (a large round table; the main table), gyeotban (a small round table), and chaeksangban (a square table). In the royal court, a number of events were held throughout the year. Annual events occurred on national holidays such as Jeongwol (the day of the first full moon of the Lunar New Year), Dano (the 5th day of the 5th month in the lunar calendar), Chuseok (Korean Thanksgiving Day) and Dongji (winter solstice), as well as the birthdays of the royal family members residing in and outside of the court, the nomination and marriage of the crown prince, and welcoming events for foreign envoys. Jinyeon was a joyous feast in the royal court to celebrate a national event, while jinchan was held when there was a celebratory occasion within the royal family. In both cases, the banquet was planned and prepared for months leading up to the event day and the preparation process was kept on record. During large royal banquets like jinyeon or jinchan, high-legged tables were set up. The tables were piled with tteok (rice cake) in a variety of colors and styles to make unique patterns, hangwa (traditional Korean snack) and fruits stacked in amazing towers. These stacks of food were generally 40-60 centimeters high, and held the meaning of wishing for prosperity and longevity of the king. The foods presented on the table were only for appearances and not actually eaten. Instead, the king would eat simple noodles and side dishes served at a smaller table before the large table was presented. 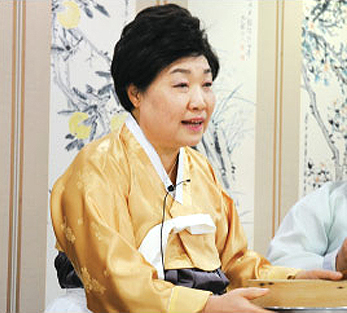 During birthdays of the royal family members or on holidays, guests were offered Myeonsang. 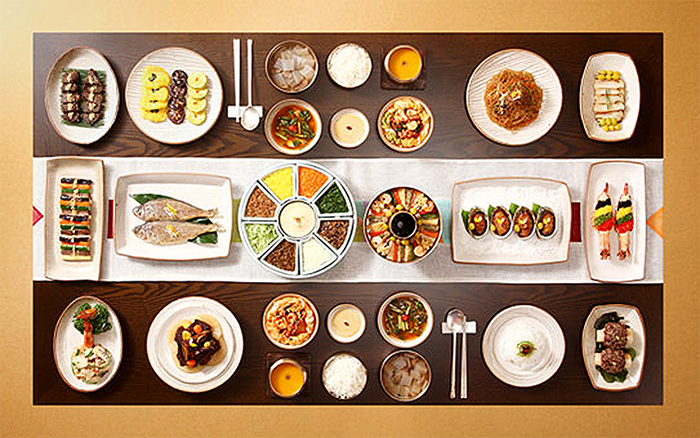 Myeonsang was a table serving noodles, tteokguk (sliced rice cake soup) or mandu (dumplings) rather than rice. Side dishes of this table included pyeonyuk, hoe, jeonyuhwa and sinseollo (royal hot pot), as well as tteok and hangwa for dessert. When a banquet was held, not only were royal guests offered food but other banquet participants as well, including the court musicians, dancers and soldiers, although tables were served by rank and position. After the banquet was finished, the remaining dishes were distributed to the king’s relatives and servants. Royal foods were prepared by court maids, who were given strict training about cooking from early childhood, as well as male cooks. Various kinds of royal cuisine were made with diverse cooking methods, as the foods were prepared using fresh seasonal ingredients and local specialties, including seafood, meat, vegetables and grains, to be served to the royal family. Vegetables and fish that looked irregular were not used. Instead, only ingredients that looked nice and the best parts of the ingredients were used to offer the best taste and style of the foods in hopes that the king would govern justly. Strong seasonings were not used in food preparation, and strong tastes, such as foods with salty and spicy flavors or with a strong smell, were avoided, so the meal could deliver the natural taste of the ingredients used. The Joseon Dynasty royal cuisine, which features such strict customs and manuals, was proclaimed an Important Intangible Cultural Property. 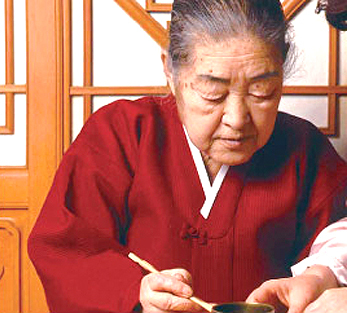 Han Hui-sun (the first master of royal culinary art, 1889-1972) was a court maid who prepared meals for the last two kings of the Joseon Dynasty (King Gojong: 1863-1907, King Sunjong: 1889-1971). 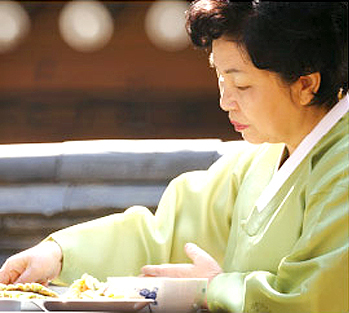 Hwang Hae-sung succeeded to the title (the second master, 1920-2006) and promoted royal cuisine. Now, Han Bok-ryeo (the third master, 1947~) and Chung Gil-ja (the third master, 1948~) have followed in their footsteps.